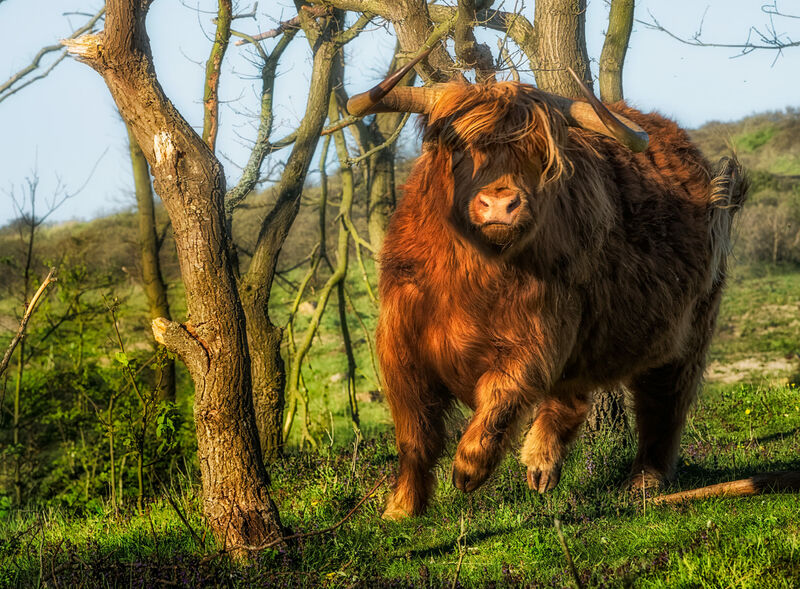 Scottish Highland bull charging down the slope of a dune near Castricum, NL. I was photographing this Scottish Highland bull from a position lower on the slope while he was rubbing himself against some bare trees. Then all of a sudden he started to run in my direction. I didn’t wait to see if I could squeeze off a few more nice action shots but quickly stepped aside, stretching my arms above my head and making a noise (a much louder shout would’ve been more appropriate, though). All of his approximately 1800 pounds thundered right past me at amazing speed (much faster than I could ever hope to run). He came to a stop near a tree lower down the slope and again started rubbing against it. It almost seemed like he wanted to play a prank on me (“There’s that photographer again; let’s scare the socks off him.”), but he may just have been more irritated than usual. It’s the breeding season; there were cows around, and one other bull, grazing quietly. Also, I think I have seen him make a sudden run across a field before, but that was last autumn. Usually these Scottish Highlands move around quite leisurely, unbothered by anything whatsoever and not bothering anyone else. This same bull appears majestically in some of my other pictures, like this one.